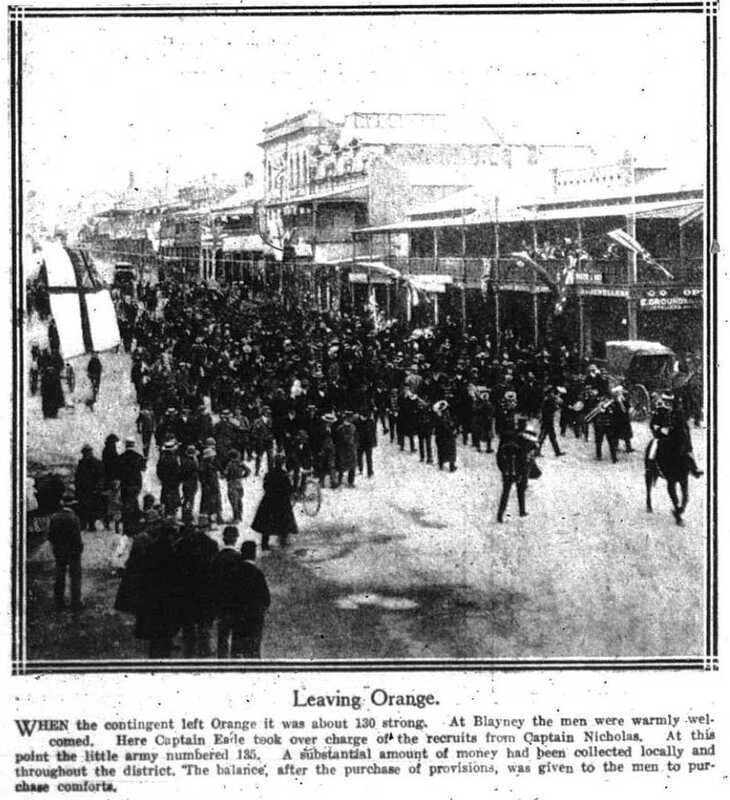 ‘On Monday (yesterday) morning the “Coo-ees” formed in procession, and marched to the soldiers’ monument in Summer-street, where, at ten o’clock, the Mayor, Alderman McNeilly, presented a flag to the Orange unit of about twenty men. Corporal McLean received the flag on their behalf. The Mayor, in the course of an eloquent speech, said he trusted that McLean would lead the men by his own example of uprightness and loyalty straight to Berlin. Corporal McLean briefly thanked the Mayor, cheers were given, and the Mayor then bade farewell to the contingent and wished the men God speed. A light cart was presented also to carry the Orange kits, and all men were issued one kit-bag, of military pattern. The haversack kit is now limited to kit-bag capacity, and other superfluous gear is forwarded wherever desired by the men free of cost on the railways. The men looked well with the uniform appearance of the haversacks containing over- coat and such small things as toilet necessaries. The kit-bags and haversacks were purchased from Walder’s, of Sydney, and 200 blankets and 100 overcoats arrived from the military headquarters. The weather was cloudy as the column set forth, and more rain was expected. They arrived at Millthorpe last night for dinner at six, and a social evening followed. The route taken was via Lucknow and Spring Hill, where the “Coo-ees” were entertained at lunch and afternoon tea respectively. THE “SNOWBALL” GROWING AS IT ROLLS. The Great Western “snowball” continually rolls eastward, increasing in size as it rolls. The men are generally in good health and in the best of spirits, the latter condition not entirely unconnected with the fact that the Minister for Defence has agreed to their being paid from the date of enlistment, whereas they had been under the impression that there would be no pay until they went into camp at Sydney. Mr. Pigott, M.H.R., was the medium through whom Captain Hitchen received this welcome information. The Minister has also instructed that dungarees are to be issued at Lithgow or Wallerawang, so that the men may finish their march in some approach to uniform. At Blayney, Captain Eade took over the duties of enrolling officer from Captain Nicholas, and it is understood that at Lithgow, Captain Eade will be similarly relieved by an officer sent from Sydney to take the column in charge. After leaving Orange, “Hitchen’s Coo-ees” took the road for Millthorpe. Three miles out, however, at Hinchenbrook, the lads found that a light repast consisting of tea, cakes, etc., had been prepared, and they had to storm this trench before they could advance any further. Mrs. Maddrell sang, “God be with you till we meet again,” the “Coo-ees” joining in the chorus. The girls then pinned bouquets in the dusty coats and marched along a mile or two with the column, carrying bannerettes. The rain held off, and cold winds made ideal marching weather. It was only three miles further to Lucknow, where, on arrival, the first thing that met the marching men’s eyes was the Union Jack that came from Lucknow, in India, to the school children, in exchange for a similar piece of bunting. Mr. C. Blunt, and the Rev. R. H. Kelly extended a hearty welcome, and an invitation to dinner, and to the dinner that was set before them they did more than justice. Lucknow did as well in catering for the “Coo-ees” as they have in every other patriotic movement; £250 has been given locally for patriotic purposes, and there are seven young men to represent the little hamlet at the front. One more has decided to march with the column. Monday, the 25th, was destined to be a day of feeds, for after leaving Lucknow, with the best wishes of the inhabitants, warmly voiced, still ringing in their ears, the boys had only stepped out a mile or two when they found that Spring Hill had made arrangements for “after- noon tea.” The meal was worthy of a better name. Winding along the road through the valleys of the Canobolas, between the famous May hedges, all in bloom, Millthorpe at last was reached about five o’clock. The wind was now piercing, and Millthorpe residents declared it the coldest day of the year. The town band met the column at the town boundary, and following Molong’s example, the shops wore closed, and all Millthorpe and the surrounding district assembled along the line of route to do honor to the boys from the west. There was not room in Frape’s Hall to accommodate the number of persons that wanted to dine with the “Coo-ees.” However, meals were taken in relays, and the “Coo-ees,” fast becoming experts in the matter of eatables, declared that they had not had a better dinner than was placed before them by the ladies of Millthorpc. Mr. Hector was in the chair, and after the loyal toast and that of “Our Allies,” the Rev. Hugh Kelly proposed the health of Capt. Hitchen and his “Coo-ees,” to which the captain and Q.M. Sgt. Lee responded. After the tables had been cleared away, an excellent concert was provided by local artists, and one or two of the recruits. This was followed by a recruiting appeal with two “converts,’ and the evening concluded with dancing until 3 a.m. Needless to say, most of the “Coo- ees” were in bed long before that hour.